The Jersey Girls and Boys State programs has 16 new graduates from HMHS and HHHS. The Girls State and Boys State Graduates were in the Independence Day Parade on July 4. From Left to Right: Grace Figlioli, David Doyle, Rachel Rosenfeld, Sara Fisher, Kelly Camperson and Chris Snyder. Haddonfield American Legion Post 38 has announced that 16 class of 2018 students from Haddonfield Memorial High School (HMHS) and Haddon Heights High School (HHHS) graduated from the Jersey Girls State and Boys State programs. 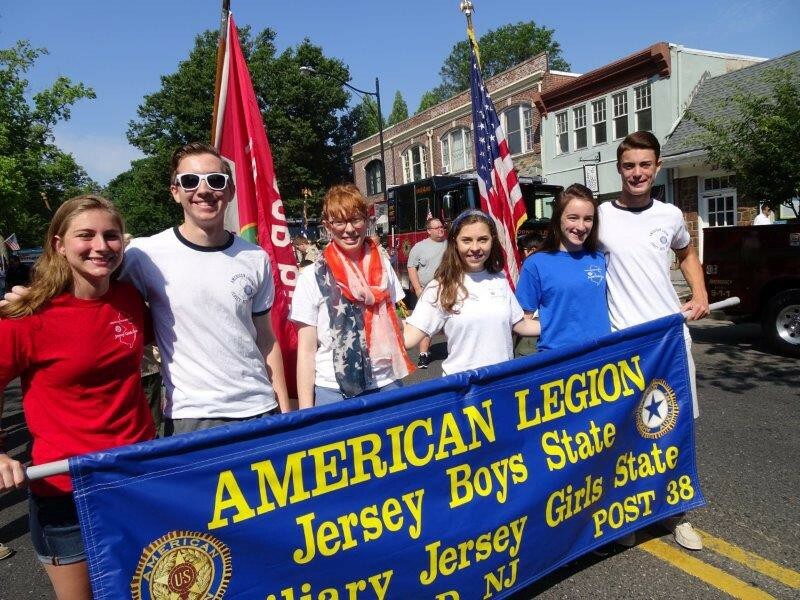 Six local Jersey Girls State and Boys State graduates from HMHS and HHHS marched in the Haddonfield Independence Day parade on Tuesday, July 4. From HMHS was Grace Figlioli, Rachel Rozenfeld, David Doyle, Kelly Camperson and Rachel Rosenfeld. From HHHS was Sara Fisher and Chris Snyder. The Boys State and Girls State programs are important parts of the New Jersey American Legion’s “Youth Americanism Program,” whose purpose is to develop good citizens by inspiring the youth of New Jersey to take a more active and intelligent interest in the operation of the state and nation and in the privileges and responsibilities of citizenship. The NJ Boys State and NJ Girls State programs were conducted on Father’s Day, June 18, through Friday, June 23. Girls State was conducted at Georgian Court University in Lakewood and included Kelly Camperson, Grace Figlioli and Rachel Rozenfeld from HMHS as well as Chloe Davis, Sydney Davis and Sara Fisher from HHHS. Boys State was conducted at Rider University in Lawrenceville and included Jason Blau, Will Ciemny and Brogan Collins from HMHS as well as Ryan Finnegan, Josh Liss, Ed Moody, Sean Murphy, Gabe Fanelle-Rojek and Chris Snyder from HHHS. Attendance at these programs is made possible by the donations of sponsors from the two communities. If you would like to know how you can get involved, please contact the Post 38 Chairs: Tom Baird (tombaird@comcast.net), Pete Hill (prhill1804@aol.com) or Jack Donovan (tincannavyman@comcast.net).